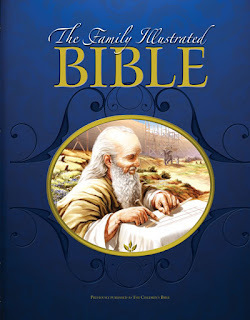 One thing I look for in a Family or Children's Bible is accuracy. It is one thing to tell children the stories of the Bible, and it is another to make sure the Word of God isn't misrepresented. This is a beautifully accurate retelling of the Word of God. Not babyish in anyway, perfect for a family devotional. The drawings are gorgeous and artistic. The stories are alive and concise. This Bible is one I am not using for my 2 youngest before settling in for the evening. They keep asking to read another story and are eager to get it out each evening. A beautiful gift idea for any family. I received a copy of this Bible from New Leaf Press in exchange for an honest review. Great job. Talk about intimidating - reviewing the Bible!